Carl's Story . . . 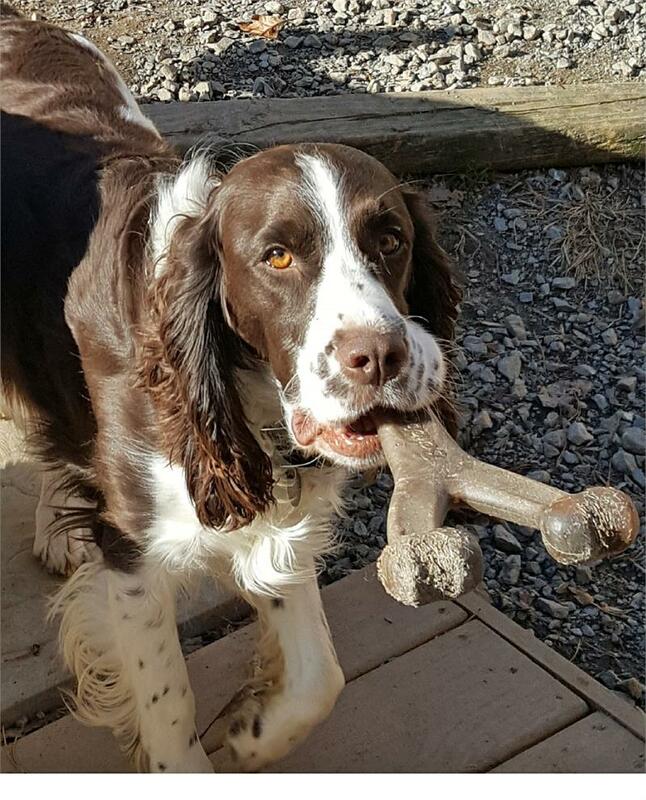 Owning four Springers plus attending graduate school proved too much for the owner of Carl and his brother, Stu. 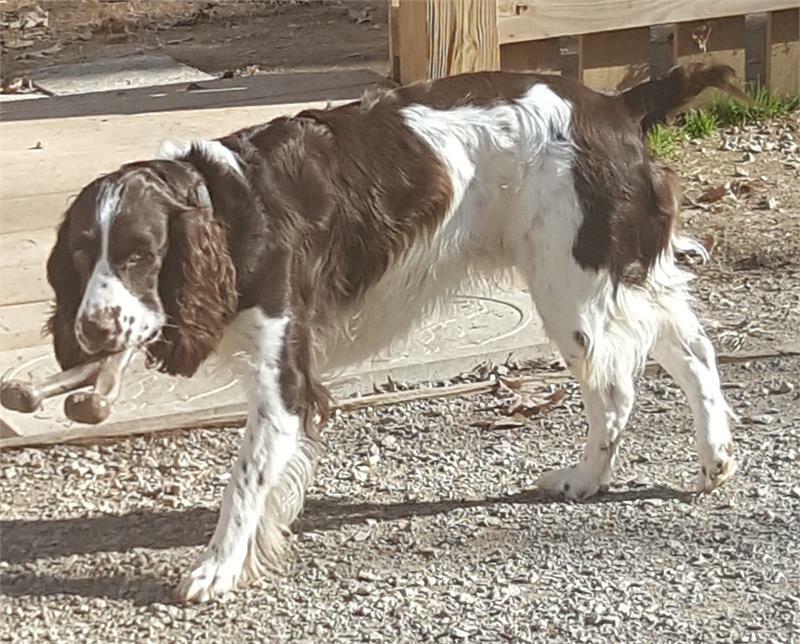 She wasn’t able to keep up with all of them so she made the difficult decision to relinquish the two younger Springers and keep the older two. So, these two Virginians became MAESSR boys. 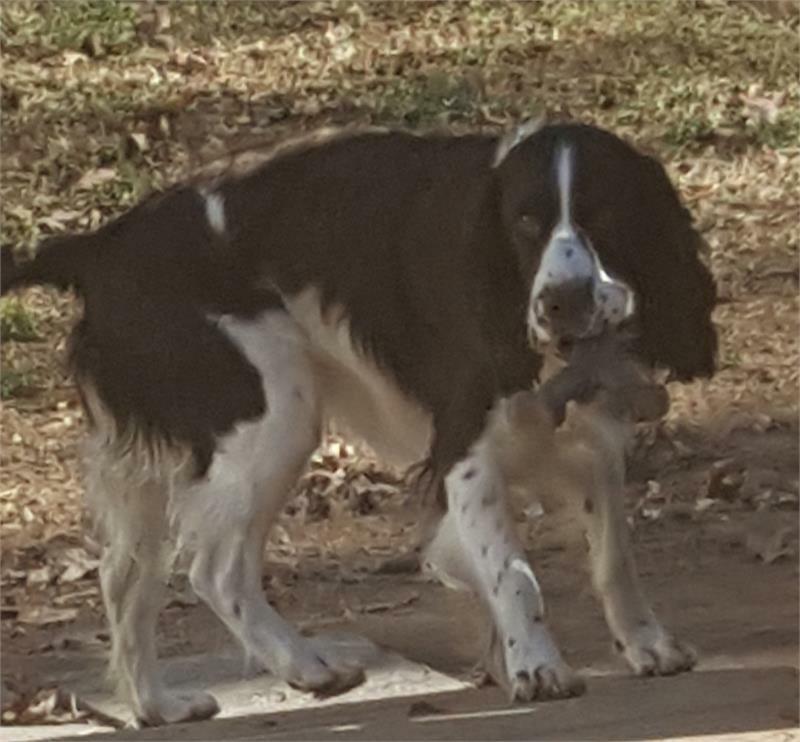 Carl was “guarding” the former owner and would growl, snap, and bite one of the other dogs in his original home. He has displayed the same behavior in his foster home if he is getting attention and another dog walks up. For this reason his foster mom feels that he would be best as an only dog. Carl was on an anti-anxiety medication when he came to MAESSR. The medication was changed and a supplement was added. This has helped Carl’s anxiety levels about new things and different situations. He is not destructive; he just frets. Carl’s adoptive home will be required to keep him on the medication for a minimum of six months after adoption. Carl is housetrained and has met children 5, 8, and 15 years old with no issues. He also has been exposed to toddlers. He doesn’t have much exposure to cats but he does chase squirrels so cats probably would be chased as well. This boy is an “alert” barker. He does not dig, jump a fence, or exhibit submissive urination. He has no separation anxiety, but Carl is scared of gunshots. He does beg for food and counter-surf, and he will jump on people. If a slipper or shoe is available, Carl will chew it, so his new family will need to direct him to proper chew toys. He does like toys and a ball for playtime. Carl knows the commands “sit” and “stay”; he’s not terribly reliable when it comes to “down.” As a puppy he used a crate but does not currently use one. When walking, Carl uses a gentle leader but he still pulls a little. He is not trusted off lead for a walk but is allowed in the front yard off lead. As a passenger Carl rides well in the car. He does not like to swim. When it comes to grooming, there are no issues. Carl has been shaved two times a year and he has no problems with his ears and feet being handled. Carl is a total love bug to people. He would let you love on him until you rub off all of his fur! He currently sleeps on a dog bed in his foster parents’ room. He would prefer to be in the big bed, but there is no more room! Do you have room in your heart, home, and possibly in your big bed for Carl? He would love to be a part of your family.